Ultramarathons are any races that go past the typical marathon distance of 26.2 miles (42.2K). For distance runners, the ultramarathon is a dream race. With most courses taking place on trails in some of the most scenic parts of the world, ultramarathons combine a sense of adventure with an extremely physically demanding and rewarding experience. If you’ve completed a marathon and are considering doing an ultra, you may find that it’s ‘easier’ to go a further distance! Some consider ultramarathons to be easier even than standard marathons, given that they take place on more varied terrain and that the challenge, rather than finishing in as fast a time as possible, is to merely complete the course. Whereas regular marathons demand that participants put themselves through 26 plus miles of unforgiving tarmac, a softer, more irregular ultramarathon track places less stress on your joints. What’s more, whereas walking in a marathon triggers encouragements from the watching crowd to ‘keep going’, walking in an ultramarathon is something everyone competing must come to terms with ultramarathons to be easier even than standard marathons, given that they take place on more varied terrain and that the challenge, rather than finishing in as fast a time as possible, is to merely complete the course. Whereas regular marathons demand that participants put themselves through 26 plus miles of unforgiving tarmac, a softer, more irregular ultramarathon track places less stress on your joints. What’s more, whereas walking in a marathon triggers encouragements from the watching crowd to ‘keep going’, walking in an ultramarathon is something everyone competing must come to terms with. The most famous ultramarathon was completed long ago by Pheidippides, the Athenian messenger, who ran from Athens to Sparta to seek help against the Persians. He completed the 153 mile distance be the next day. In 1982 an official expedition set out to see if it was possible to complete that distance in under 1.5 days, and three men were successful. While ultra-running has been around for centuries, one of the first ‘modern’ ultrarunners was Edward Payson. In 1867 he walked from Chicago to Portland in 25 days. The distance was soon formalized into a 6 day race called the ‘long-distance championship of the world.’ Most ultras were primarily walk-only in the beginning, eventually taking a more walk/run approach. In 1921 the sport went international when a WWI vet in South Africa created a 55 mile run to pay homage to fallen veterans. This ‘Comardes Marathon’ is today’s oldest-running ultramarathon, attracting thousands of participants from across the world. 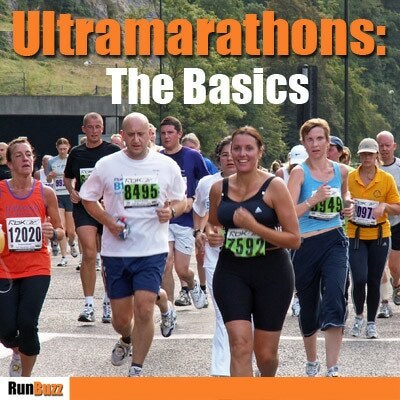 Ultramarathons are divided into two categories: those based on distance and those based on running as much as you can within a specific cutoff time. Common distances for ultras include 50K, 50 miles, 100K, and 100 miles. Common cutoff times are 6, 12, and 24 hours. Yes, people seriously run 100 miles at a time or for 24 hours straight. You can train for a 50K on a plan similar to a marathon training plan, but add on an hour run the day after your long run to get more acclimated to running on tired legs. You should also try to make one of your weekly runs a trail run or a run done on a hilly course, to prepare yourself for some elevation gain during the race. Since most runners run a minimum of 5+ hours for the shortest ultra, you should start testing out ‘real food’ options while training. Gu’s are great for shorter distances but, when you’re on your feet for such a long amount of time, you’ll need some better fuel. Stick with basic carbs (with lots of salt). Think peanut butter sandwiches, pretzels, dates, or dried fruit. You will burn about 500 calories an hour, but your body can only absorb half that during that time. Make sure to bring enough food so that you’ll have 250 calories per hour on the course. Most ultras will have very well stocked aide stations with food ranging from pizza to bagels to candy, but many runners prefer to bring foods they know won’t upset their GI system. Marathon Des Sables: A 6 day, 154 mile trek through the Sahara desert in Morocco. If the thought of beach running makes you sick then you may want to skip this one. Grand to Grand ultra: This 147 mile 7 day course takes you from the Grand Canyon to the Grand Staircase. With much of the course passing through the Utah desert, this is an absolutely gorgeous way to see some of the most scenic parts of the US. The Jungle Ultra: Located in Peru, this ultra is 142.6 miles and primarily downhill (yay!). As you run through the Amazon jungle you’ll pass through 70 rivers and streams, sometimes zip-lining over them. Spartathalon: You can run the same course Pheidippedes ran in 490 BC. Hopefully you’ll have a much better ending (he collapsed and died of exhaustion after giving his message). Erica House has her Masters in Psychology and has been teaching at the University level since 2007. She is certified as a Personal Trainer through the American College of Sports Medicine as well as a Certified Intuitive Eating Counselor. After quitting smoking and maintaining a 50 pound weight loss she became passionate about helping others on their journey to lifelong happiness and wellness.